Happy Earth Day Durango! It’s great that there’s a dedicated day every year where we celebrate this wonderful planet we all live on. We can take this day to reflect on all the natural wonders that surround our community and think about how to help Durango live more harmoniously in the natural landscape. I am always happy to see more bikes, pedestrians and electric cars on the roads and people out enjoying the natural surrounds. If you’d like to power your new electric car or E-bike with sunshine, give us a call and we can help you get solar panels working for you! Tri-State, the electrical supplier for the Durango area, is under investigation by congress for funding a lobbying group that is trying to weaken the Clean Air Act. I always suspected that Tri-state was not pro-solar, but this confirms my suspicions. It isn’t surprising since Tri-state has a lot of capital invested in coal burning power plants, but its a shame that they are using rate payer funds (i.e. your money if you live in the Durango area or anywhere in southwest Colorado) to undermine environmental protections instead of investing the money in cheaper, renewable energy projects such as wind and solar. I guess they’re just going to dig in their heals and get drug screaming into the future. Someone should sit down with them and explain what the term ‘sunk cost’ means…and maybe the word ‘ethical’. Silicon Wafers For Solar Panels From Appalachia? The ingots are cut into wafers and doped with Boron and Phosphorus to create an electrical potential that is excited by photons to produce electricity. Who knew something so high tech has its origins in the Appalachian mountains? More investment is going to solar and wind than coal, natural gas and nuclear for generation capacity around the globe. This is a trend that has been increasing since 2010 according to an article about solar and renewable energy in the Wall Street Journal. The main reason for this trend is that solar and other renewable energy sources are the lowest cost option to generate electricity on a utility scale. Other reasons for the increased investment in solar and wind is that the capital is easier to come by as there are pension funds and other long term investors that are willing to finance solar farms and solar farms are easier to get permission to install with respect to coal, natural gas and nuclear power plants. 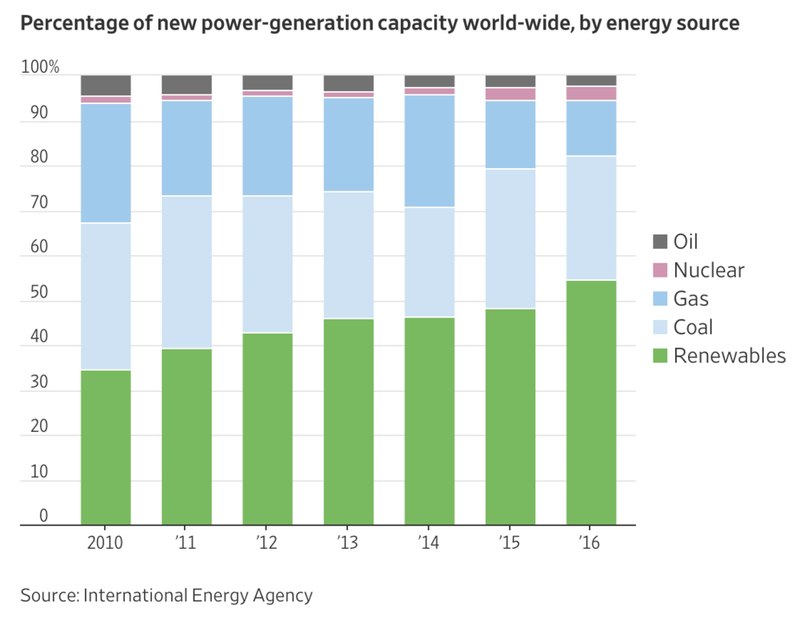 Below is a graph that shows the percentage of new power generation capacity world wide from 2010 to 2016. This is great news for renewable energy and solar and wind in particular. Experts estimate that the price of solar and wind will continue to fall and replace a larger portion of the energy generation mix for the globe. Tri-State supplies power to LPEA which then sells it to its customers. The electricity that Tri-State produces releases more CO2 per unit of power than all other power producers in the US except one. Tri-State has many coal burning power stations and therefore produces more CO2 to generate electricity. LPEA is contractually obligated to purchase 95% or the electricity they sell from Tri-State until 2050. 1. The electricity you produce from your solar panels in Durango for example will offset more CO2 than the same production in a less polluting area such as PG&E in California. PG&E generates about 100 lbs of CO2 per MWH of electricity whereas Tri-State generates about 2,100 lbs of CO2 per MWH of electricity; about 21 times as much CO2 for the same amount of power! 2. The requirement to purchase 95% of the power LPEA sells from Tri-State means that they are legally blocking LPEA (and you and me) from purchasing wind, solar or natural gas generated power from someone else. Tri-State might have their contract on their side now, but if they continue to resist solar and other renewable sources of power they will only hurt themselves in the long run. The Larsen C Ice Shelf in Antartica is breaking away from the mainland and a massive rift has formed in the shelf. This isn't just a small iceberg that is breaking off, but rather a piece of ice about the size of the state of Delaware. The crack alone is 70 miles long, 300 feet wide and about a third of a mile deep. Click on the image below to learn more from NASA. So if you like the idea of all that ice staying in Antartica and not melting and ending up in downtown Miami (or any other coastal city in the world), think about installing some solar panels on your roof and get your electricity from the sun and not coal. Its a small step in the right direction, but every little bit helps. Suniva, a Chinese-owned solar company, and SolarWorld, a German-owned solar company have filed a petition with the International Trade Commission. Both of these companies have filed for bankruptcy. These two companies are asking that the US federal government impose tariffs on imported solar cells and establish a minimum price for imported solar panels. SolarWorld was behind another petition in 2012 that led to a trade tariff on imported Chinese solar panels. They claimed then that Chinese companies were dumping solar panels on the US market. The economic definition of dumping is selling a product below your cost which is obviously unsustainable over time. After the tariff on Chinese panels was imposed, production of solar panels by the affected companies moved to Taiwan, Vietnam and India. Interestingly, they were able to sell their products at the same price while producing them in these new locations. So are Taiwan, Vietnam and India dumping as well? This new complaint by Suniva and SolarWorld argues that imported cells and panels need to have their prices artificially inflated (through a tariff) in order to protect domestic production of solar panels. And this is coming from German and Chinese owned companies. So exactly which jobs and profits are being protected? SolarWorld employs 800 people in its Oregon factory and Suniva employs 300 people in Georgia. The corporate profits from these two companies go to Germany and China. The Colorado Solar Energy Industries Association (COSEIA) estimates that if this tariff is imposed, about 2,000 jobs in Colorado will be lost and 88,000 solar jobs will be lost nationally. Researchers with the US Forest Service and the University of California have recently performed research on the health benefits of trees. OK, we know that trees provide shade, consume CO2 and clean the air, but this research was more about how a lack of trees increases heart disease and respiratory illness. Entomologists and Arborists have been studying mass tree die off from infestations of insects in the midwest and now in Southern California. Very similar to the pine beetle infestation we are experiencing in Colorado, but a different insect, different trees. Their study of the midwest tree die off showed an increase in deaths in areas where the trees died off. The Polyphagous Shot Hole borer from Southeast Asia is primed and ready to kill off 26.8 million trees in Southern California or about 40% of all the trees from the beach in LA to the Nevada border. General Electric, Mars and even Exxon Mobil have recently announced that they will continue to reduce emissions and work towards their own climate change goals regardless of the Trump administration's efforts to roll back regulations that push utilities to burn cleaner fuels to make electricity. Mars Inc. said this week, "The science is clear and unambiguous: Climate change is real and human activity is a factor," adding it was, "disappointed the administration has decided to roll back climate regulations." On March 28th, InBev's CEO Carlos Brito said, "Cutting back on fossil fuels is good for the environment and good for business." One of the largest brewers in the world that brews Anheuser-Busch among many others, has pledged to use 100% renewable energy for all its global operations by 2025. Exxon's CEO said earlier this year, "climate risks warrant action" and called the Paris deal "an effective framework" for dealing with climate change. The shift towards renewable sources of energy such as solar and wind has occurred. Companies and individuals that think long term aren't swayed by these recent rollback to environmental protections. The Trump administration will be gone in the not so distant future and the pendulum will swing back towards science and reason. When considering long term capital outlays, four to eight years is a short amount of time. Utilities in California, Colorado and New York are working on combining solar panels, batteries and communication networks with the utility control room to fit more solar into the existing grid. According to a Wall Street Journal article in Monday's paper (March 6th, 2017), these 'virtual power plants' allow the utility to store excess solar energy during the day in batteries and use it in the evening and at night when the sun isn't shining. PG&E, a San Francisco based utility, is shutting down the last nuclear power plant in California in 2025 and is planning on investing $1 billion through 2020 to modernize its grid by incorporating batteries and intelligent communication to offset the loss in generation from the Diablo Canyon Nuclear power plant. Consolidated Edison in New York has invested $200 million in a virtual power plant spread among several buildings in New York City that can decrease peak demand by as much as 52 megawatts. This virtual power plant allows the utility to smooth out its demand through out the day. By decreasing its peak demand by 52 megawatts it can delay installing roughly $1 billion in conventional power equipment (e.g. a new traditional power plant) for another 20 years. Saving $800 million over 20 years by installing communication networks, batteries and solar panels seems like a good idea to me. PG&E's senior vice president of strategy and policy, Steve Malnight said in the article, "We are rethinking the grid and how it operates". I think this is very forward thinking of PG&E and something all grid operators across the country should be doing. Change is always hard and it seems to be especially difficult for entrenched industries such as electrical utilities, but that doesn't mean that their only course of action is active resistance to change. Accepting the changing landscape of power production and working with these new sources of production is much more productive than the alternative. California plans to get 50% of its power in 2030 from renewable sources and currently produces more peak power than it can use on certain days. On these sunny days in California, the state's utilities sell this excess power to neighboring states, sometimes at very low rates. With a smarter gird and storage capacity, they will be able to use more of their own solar energy and not export to neighboring states. Like all things solar, this concept can be scaled up or down. Individual cities or homes can use this same concept to increase self consumption of solar energy. As our homes become smarter they can intelligently control our appliances such as the water heater, dish washer, etc to turn on and off based on the production of the solar system on your roof and the state of charge of your home's batteries. Cities could do this on a neighborhood basis with a large battery bank installed for each city block for example. Intelligent use of energy through conservation, peak demand reduction and self consumption is one possible outcome for the grid. There are other power production options, but the smart choice is often the best choice. The photovoltaic effect was first discovered or credited by Edmund Becquerel, a nine-teen year old French physicist in 1839 when studying an increase in electron emissions reacted to a pair of electrodes when exposed to light. In 1876, William Grylls Adams and a student, Richard Day, discovered that when selenium was exposed to light, it produced electricity, thus the discovery of photovoltaics. In 1881, the first solar panel was invented by an American inventor, Charles Fritts who was inspired by the photovoltaic effect. Seven years later the solar cell was patented by Edward Weston of the United States. Albert Einstein also theorized about photoelectricity effect in 1905. He believed that light could create electricity if it behaved, sometimes, like a particle rather than a wave. His theory outlined how a light particle might deliver enough energy, all at once, to knock an electron off an atom and create an electric current. A decade later, Einstein’s theory proved to be correct by Robert Millikan. Albert Einstein received the Nobel Prize for his work with photovoltaics in 1921. His idea helped revolutionized solar energy and help make the solar panels work as they do today. It took almost thirty more years for the first practical photovoltaic cell to be invented. In 1954, Calvin Fuller, Gerald Pearson, and Daryl Chapin, discovered the silicon solar cell. This cell actually produced enough electricity and was efficient enough to run small electrical devices. Because of this discovery, it significantly helped improve daily life around the world by providing power to many utilities such as water pumps for irrigation. Within six years, the PV (photovoltaics) cell technology grew very rapidly and off-grid home-owners began purchasing solar panels for their homes. 1970’s, was a great time for renewable energy sources because there was the first Energy Crisis with oil shortages, and the National Renewable Energy Laboratory (NREL) was established, which helped increase further research on PV technology. Since the 1970’s, solar panels and solar energy has increased dramatically in numerous places around the country. Solar modules provide over one-million homes and businesses with electricity, which provide thousands of jobs and sustainable opportunities. Businesses are now installing solar panels in homes and commercial buildings. Solar helps eliminate electricity bills, reduce carbon emissions and they do not create noise or pollution, just clean energy. Commercial solar installations benefit not only from the direct savings on your electric bill, but also from preferential depreciation schedules by the IRS and potential USDA grants. What this adds up to is a very quick return on investment for commercial solar in the Durango area. With a lot of businesses looking to decrease overhead and increase their bottom line, controlling energy costs will make them more competitive now and certainly down the road as electric rates continue to rise and federal, state and local incentives are phased out. According to NASA, the first six months of 2016 have each individually been the hottest months respectively ever recorded (which started in 1880). Also, not surprisingly if you think about the math, the first six months of 2016 have been the warmest first half of the year ever recorded. This means that the sea ice in the arctic has shrunk to its smallest size ever recorded as well. This is good news for shipping companies, but not for polar bears and seals. Now the question is what is causing it. There are some theories out there and we don't know 100% for sure what the cause is, but putting solar on your roof can't hurt right? I noticed a picture in the Wall Street Journal of the Tsunami Zone in Japan with trash bags full of radioactive waste with a solar array in the background. How ironic right? It seems obvious to me that solar is a better energy source than nuclear reactors. When there's a radioactive spill they have to evacuate entire cities. When there's a solar spill they just call it a nice day! On the opposite page of the page there was a small article about how warming waters are destroying Australia's Great Barrier Reef. No connection was mentioned connecting the two articles, but to me alarm bells are going off. How many more signs do we need that we need to change course? The Federal government extended the tax credit for solar another five years! This tax credit will greatly help the expansion of solar in the US and more specifically in the greater Durango area. Solar is really catching on both nationally and internationally so I'm very happy to see our congress has chosen to keep the momentum going and further promote solar.